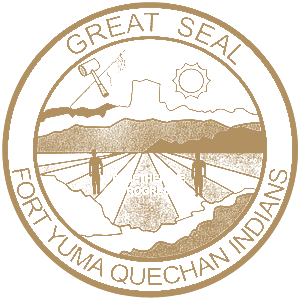 Home of the Quechan (pronounced Kwatsáan) Indians, Fort Yuma-Quechan Reservation is located along both sides of the Colorado River near Yuma, Arizona. The reservation borders the states of Arizona, California and Baja California, Mexico. Encompassing 45,000 acres, the reservation is bisected on the south by Interstate 8 (I-8). Consequently, several million cars a year drive through the Fort Yuma Quechan Reservation on their way to and from Phoenix and San Diego. Originally called Camp Calhoun, the site was first used as a U.S. Military post in 1849. A fire destroyed the original buildings. By 1855 the barracks had been rebuilt. Called Camp Yuma in 1852, it became Fort Yuma after reconstruction. Transferred to the Department of The Interior and the Quechan Indian Tribe in 1884. It became a boarding school operated by the Catholic Church until 1900. California registered historical landmark No. 806. First registered June 1965. Plaque placed by the State Department of Parks and Recreation in cooperation with the Quechan Tribe and Squibob Chapter, E. Clampus Vitus, April 29, 1989. 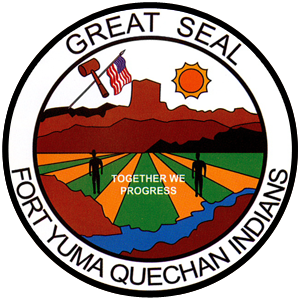 In addition to farming, the Fort Yuma Quechan Reservation counts on tourism and related business to augment its economy. The hot summers and relatively warm winter temperatures make the site a desirable winter vacation spot from November to March. To serve this audience the Tribe manages five trailer and RV parks, one grocery store, museum, casino, utility company, a fish and game department, tribal police department and court system. Responding to its location on the border between the U.S. And Mexico, the Tribe operates a seasonal parking lot in Andrade, located outside the port-of-entry into Algodones, B.C., Mexico. Other visitor attractions include the nearby California dunes and Yuma's historic areas, golf courses and shopping at San Luis, a port-of-entry community. Water sports such as fishing, water skiing and swimming at lakes along the Colorado River are also available. Visitor services are limited to RV parks. Additional services in the area are readily available in nearby Yuma.